This is my entry to this week's theme over at Illustration Friday. Why not explore the other "mysterious" entries there? Makes me think of my favorite poet, Edgar Allen Poe - Annabelle Lee and the Raven. I can't imagine a better Haiku. Is the illustration a montage of sorts of Southern Gothic work? I'm certain of the crow & the border (at least the style of the border)--& I'm fairly certain of the portrait (but my recollection of it isn't as clear as that of the "Crows" piece). 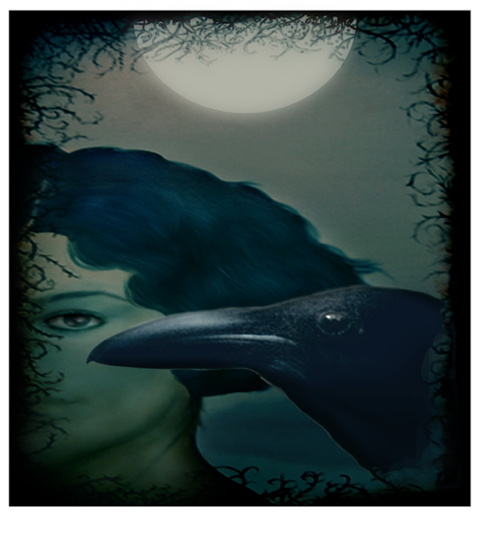 Yeah...prior oil paintings, "Southerness" and "Hour of the Raven", were partly combined to make this image 'Shopping really frees up how older images I've created can be refurbished for new meanings. This page contains a single entry from the blog posted on September 3, 2011 1:50 AM.